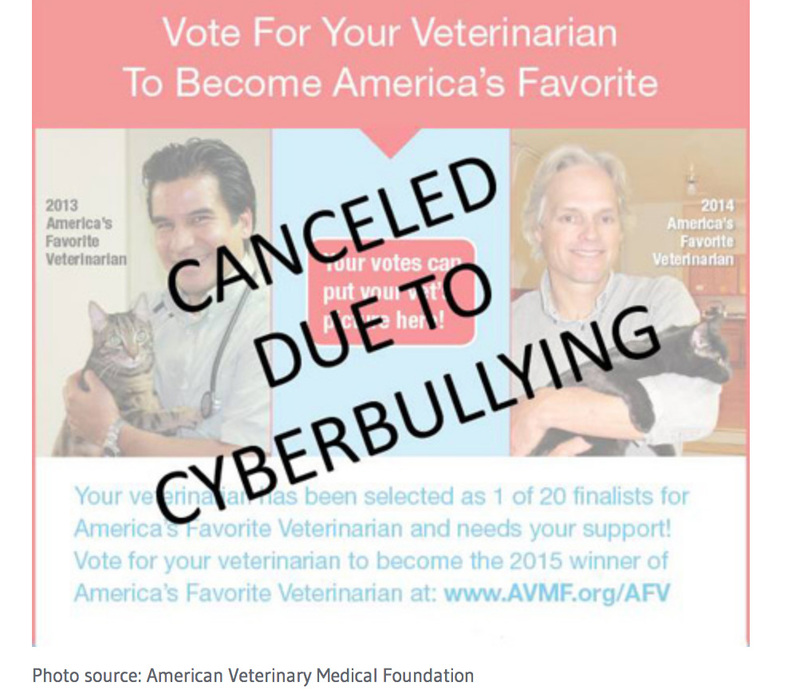 This is a follow-up story to see if any of the top 10 finalists in the infamous 2015 AVMA/AVMF’s America’s Favorite Veterinarian contest stopped declawing. What we found is that 2 of the finalists in the top ten stopped declawing shortly after the contest was cancelled and one more stopped declawing sometime in the last few years. The AVMA/AVMF cancelled this contest because Dr Gary Richter, the only vet in the top ten who didn’t declaw cats, was going to win. Thousands of people who cared about the welfare of cats were voting for him. 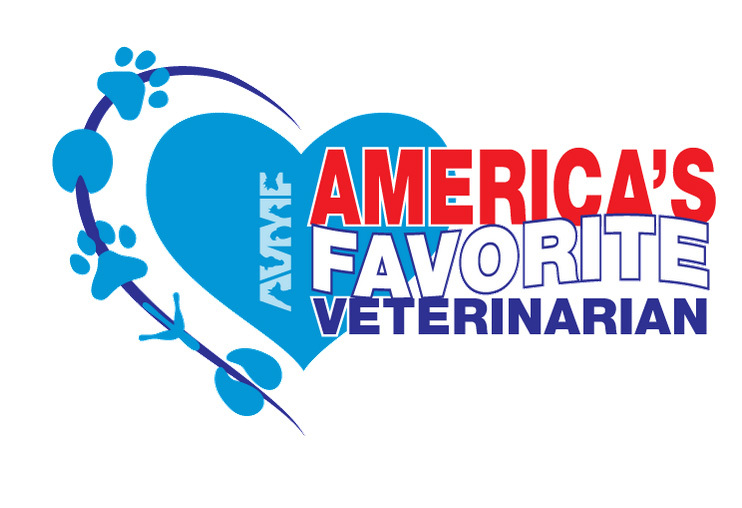 The AVMF gave the 20 finalists the “America’s Favorite Veterinarian” award and $500. For some strange reason the AVMA has deleted their 2015 press release about this contest. The AVMF also stated on their website that this contest honored and recognized those entrusted to preserve and protect the health and well-being of animals. We have seen more studies and information in the last 3 years that show how declawing always harms the long term health and well-being of a cat, no matter what tool is used to amputate a cat’s toe bones and claws. When people know better, they usually do better. I reached out to the 10 finalists in this contest in an email to ask them if they have stopped declawing and asked them their reasons for stopping or if they don’t declaw cats, why did they stop. The only responses I received were from Dr Hammerle, Dr Vargas, and Dr Richter. Since I never received a response from any of the other finalists to hear back if they’ve stopped doing this inhumane amputation procedure on cats, I had my researchers look into it. They made calls posing as a first time cat owner to each practice and asked for a price for a declaw and asked other important questions. The Top Ten Finalists in the AVMF America’s Favorite Veterinarian Contest. Dr Tina Roggenbeck- Veterinary Health Center in Saginaw, Michigan. Their employee said that they do not declaw cats anymore. I reached out to Dr Roggenbeck to ask her when and why she stopped declawing but never received a reply. Researcher called to ask for a price of a neuter/declaw. 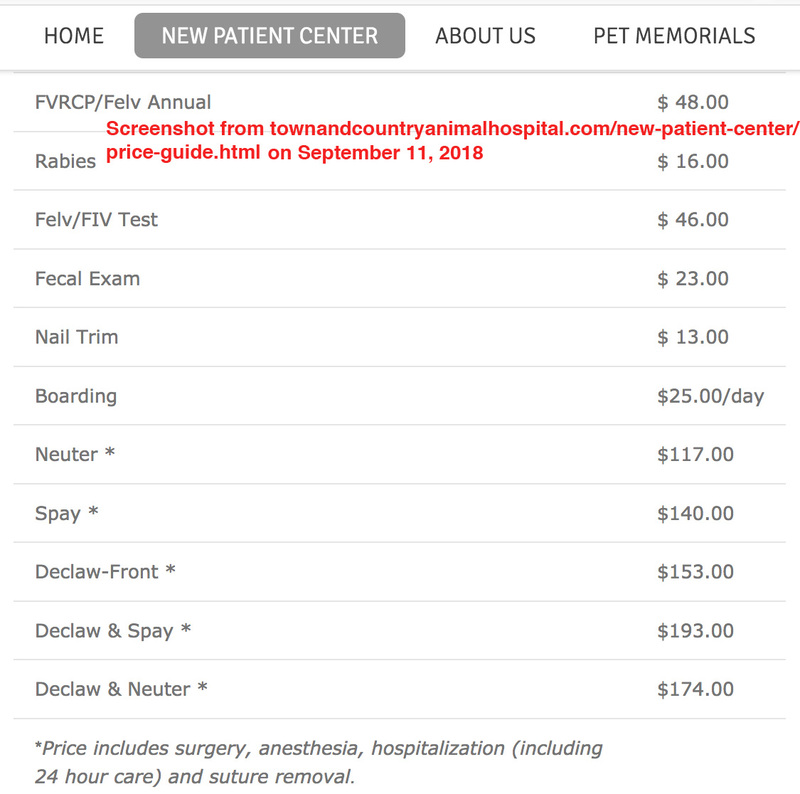 The employee actually stated that they have a Kitten Package and starting prices for a neuter/2 paw declaw is $227.27 and a neuter/4 paw declaw is $278. No consultation appointment is needed and they recommend blood work ($57) and additional pain meds. ($55) The employee said that Dr Stacy performs declaws and only does surgeries on Fridays. Dr James Radcliffe- Town & Country Animal Hospital in Wheeling, West Virginia. Employee said that all their doctors do declaws, including Dr Radcliffe, and a spay/declaw is $203. When asked if they have a kitten package for a neuter/declaw, the employee said, “absolutely, it’s very reasonable and so much cheaper.” The neuter/declaw is $180. The employee said that they do declaws all the time and they “remove the nail.” When asked if a declaw is ok for a cat and if the cat would be ok, the employee said “absolutely” and said that they see no problems in their declawed cats. Dr Pat Warpinski,- The Animal House, Green Bay, Wisconsin. When a researcher called for the price of a spay/declaw the employee asked, “Would you want to get all four declawed?” A spay/ 4 paw declaw is $235 and the employee said that all their doctors do routine surgeries when the researcher asked which vet is the most skilled at the declaw. Another employee was asked if they have kitten packages for a neuter/declaw and they said, “We do, do you want fronts or all four?” A neuter/4 paw declaw is $243. They said that they do declaws everyday and you can schedule an appointment with Dr Warpinski for the procedures. Dr Duffy Jones- Peach Tree Hill Vet, Atlanta, Georgia. 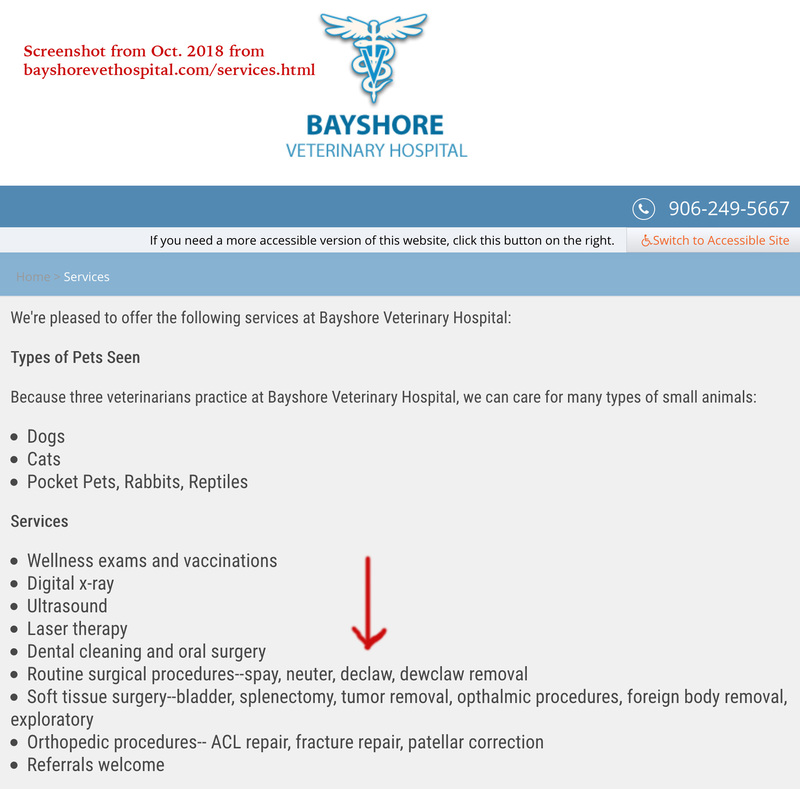 Another employee said any of their vets, including Dr Jones, can do the declaw and you have to make an appointment to discuss it with a vet and get the costs. They don’t give out prices on the phone. 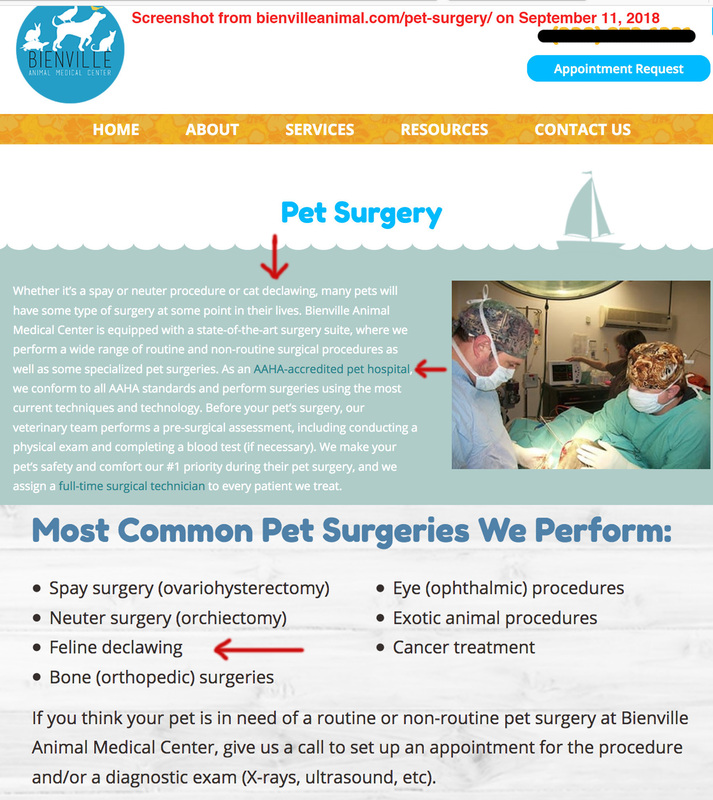 Dr Christy Layton- Timberlane Pet Hospital and Resort, Plant City, Florida. The employee said that they do declaws as a last resort and recommend scratching posts, Soft Paws, and other options. They said it’s like taking off the last digit. Another employee was asked for the price of a neuter/declaw and said that they don’t advise a declaw and it’s best to use “something else” but then gave a price for a neuter/declaw as $424-$508. They said that you can book an appointment with Dr Layton to see if the cat is healthy enough for the procedure and talk about the declaw. They said that they provide special litter for the declawed cat’s toes. Dr Lisa Aumiller- House Paws Mobile Veterinary Service in New Jersey. One employee said that they still have two doctors who will still do declaws but they had to check since they are trying to pass a law in New Jersey to ban it. They give advice on the other humane options like scratching posts, toys, etc. Here’s a post on facebook that House Paws did about the NJ anti-declawing bill. Here are the responses I received from the three veterinarians in the top ten finalists as to why they don’t declaw cats. Dr Gary Richter. Holistic Veterinary Care and Rehabilitation Center, Oakland, CA. He was the only top ten contestant that didn’t declaw cats. Dr Marcy Hammerle. The Pet Doctor, O’Fallon, MO. Dr Hammerle stopped declawing right after the 2015 America’s Favorite Veterinarian Contest was cancelled and is now part of the PawProject.org team. “I stopped declawing after the AFV contest. I listened to some of the people who reached out to me and took a hard look at all of the risks vs benefits of this procedure. I had never done many of these surgeries, always used good technique and appropriate pain medication, but there are complications even with the best techniques. I had never done any other cosmetic procedures and after researching decided that ethically I could not ever do another declaw. Dr Mitsie Vargas. Orchid Spring Animal Hospital, Winter Haven, FL. Dr Vargas topped declawing shortly after the 2015 America’s Favorite Veterinarian Contest was cancelled and is now part of the PawProject.org team. Here’s how the other 10 finalists in the contest address declawing when my researchers called as a first time cat owner. According to an employee, a few of the doctors at this hospital perform declaws including Dr Marks. You need to have an exam with Dr Marks before she can do the declaw and neuter to see if the cat is healthy enough for the procedures. She uses a scalpel for the declaw. The researcher asked if Dr Marks is skilled at the declaw and the employee said yes, and said she has performed declaws many times. The employee said that they don’t do them regularly since they don’t have many clients that request a declaw. According to the employee, Dr Marks does the procedures on Mondays. The employee said that they can do a declaw but just the front or just the back and they won’t do a 4 paw declaw. The employee looked up the price for the declaw and said a front declaw is $276 but then said that they must have stopped declawing “just the back” because there isn’t a price listed for it. Researcher asked if Dr Wages is skilled at the declaw and the employee said yes, that she would be the one that she recommends for it. 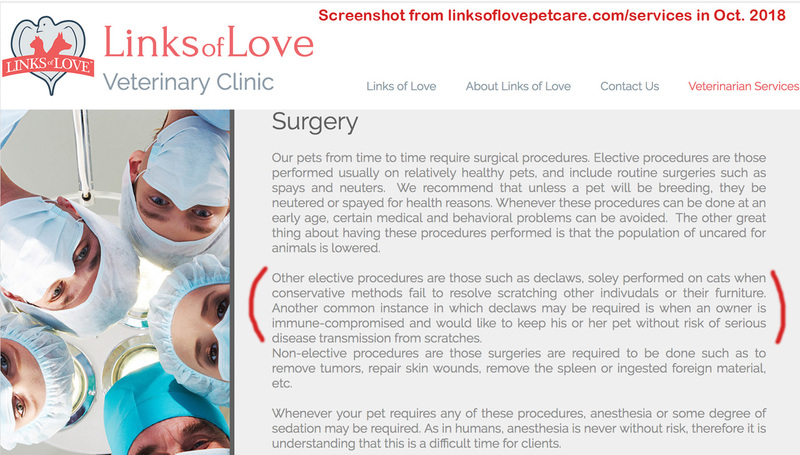 She is one of their most skilled surgeons and she has done declaws in the past with no complications they said. The employee said that Dr Wages uses a scalpel and “cuts them off. ” They said the cat will be kept overnight, given pain meds, and will be healed in 10-14 days. You don’t need an exam and can drop off the cat the same day as the declaw and pick it up the next day. Screenshot from Dr LaShonn’s website. They do not perform declaws and say it causes problems for the cat later in life including arthritis. They said they don’t recommend declawing. They don’t declaw and speak out against it. The employee said that it is illegal, really painful, and it involves chopping off half of the toes. They said that as the cat gets older it causes pain and the cat won’t use the litter box. The employee mentioned many of the humane options to the researcher. Dr Cooke works in the Internal Medicine Dept. and that dept. doesn’t perform declaws. The University of Florida Small Animal Hospital performs laser declaws. A neuter/declaw is $390-$490. 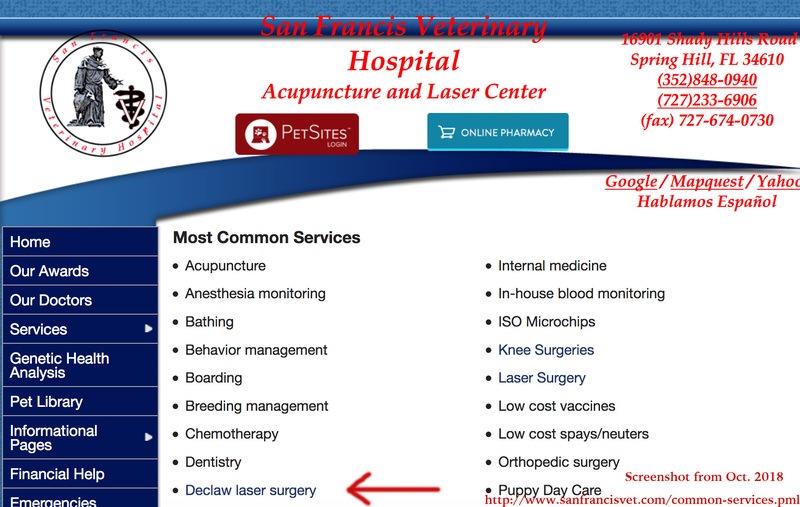 The employee was asked why a laser is better for a declaw and she said because it heals better and is not as painful. They said that any of their soft tissue doctors are able to do declaws, they do them regularly, and your cat will “fully recover” in 10-14 days. Dr Emilio DeBess. He was listed as a vet at Milwaukie Animal Clinic in Oregon but he is now a State Public Health Veterinarian in Oregon according to an internet search. An employee at Milwaukie Animal Clinic, Milwaukie, OR. where the AVMF listed he works, said that Dr DeBess is no longer working at this clinic. The employee at Milwaukie Animal Clinic said that they declaw cats but don’t do them if the cat is over 6 months old because the bone has developed more and it’s a more difficult healing for the cat. This vet practice doesn’t do any surgeries according to this facebook post about the contest. (It wasn’t an “organized campaign of cyber attacks.” It was an organized campaign for people to vote for the only vet in the top ten finalists who didn’t declaw cats. They employee said that they don’t do declaws. They said, “a number of years ago people used to have their cats declawed but veterinary medicine has moved towards not having cats declawed.” They said that it’s painful and they aren’t really removing the claws, and that declawing has to do with part of their actual toes like the digits and bones. He’s now the Chief Veterinary Officer of the American Kennel Club according to an internet search. The AVMF winners for the 2013 and 2014 America’s Favorite Veterinarian contest were as follows. Dr. Carlos Campos, who owns and practices at San Francis Veterinary Hospital in Spring Hill, Fla. The employee said that a neuter/declaw is $496 and they prefer to do the neuter and the declaw at the same time. They said they use a laser to declaw and it’s better because it “heals quicker and doesn’t leave anything behind.” They said that Dr Campos does them regularly and your cat will be healed in two weeks. Dr Tim Hunt of Bayshore Veterinary Hospital in Marquette, MI. The employee said that they only do the front declaws. Dr Hunt doesn’t usually do them. Dr Tracy Nyberg does them regularly and a declaw is $180. The declaw involves taking off the cat’s first knuckle they said. 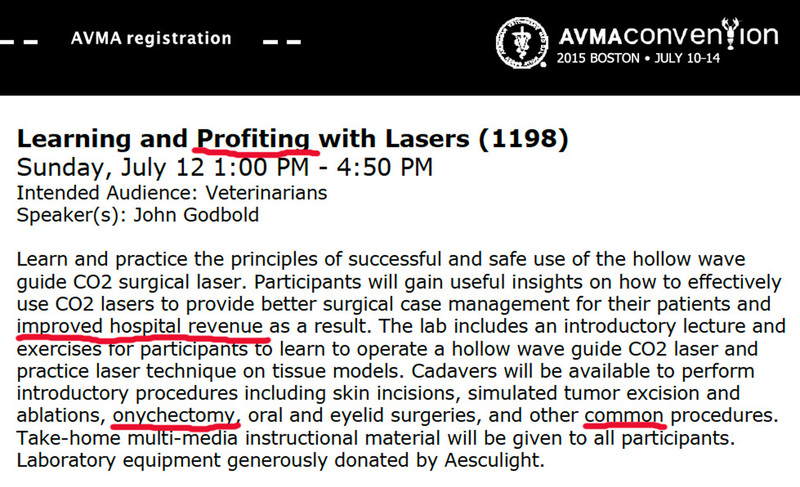 In 2015 the AVMA had this advertisement for one of the courses at their Boston Convention. How to learn how to profit from burning the toe bones and claws off cats.